A new comedy from the creative genius of Judd Apatow follows a pair of druggie losers as they reach the top of the hit-list when one witnesses a mob murder and drags his buddy into a crazy flight from mobsters bent on silencing both of them permanently. Pineapple Express stars new sensation Seth Rogen and James Franco, co-stars Rosie Perez and Gary Cole, and is directed by David Gordon Green. $23.245 million on 3072 screens. Recently I saw an article that talked about the hardest-working men in Hollywood. Seth Rogen placed second on that list, and that didn’t come as a surprise. The guy appeared in seven movies released during 2008! Granted, he did voice work in three of them and offered cameos in the other two, but the dude sure did keep his dance card filled. Of Rogen’s two lead roles, Pineapple Express came out first. Here Rogen plays Dale Denton, a process server who seems to enjoy his life. He dates hot high school student Angie (Amber Heard), and his job allows him plenty of time to pursue his favorite hobby: smoking dope. That means frequent visits to his goofy dealer Saul (James Franco). During one trek to obtain pot, Saul introduces Dale to a super-potent blend called Pineapple Express. Dale digs this stuff and eagerly partakes. Indeed, when Dale goes to drop a subpoena on Ted Jones (Gary Cole), he takes a smoke break first. While he puffs, he sees a murder take place inside Jones’ house. Understandably freaked out, Dale flees the scene and drops his Pineapple Express roach in the panic. Bad move: the main pot supplier in the area, Jones identifies the blend. Dale rushes to Saul for assistance, but the dealer realizes the pot could be traced to him. From there they embark on a series of misadventures as they attempt to stay alive. From now on, I will recognize no words scarier than these: “directed by David Gordon Green”. I’d not thought about the director since I saw his indie flick George Washington way back in 2002. To say that the film didn’t impress me would be an understatement. Indeed, I thought the movie was a self-indulgent piece of nonsense that I thoroughly disliked. Green slipped under my radar until Express, and I didn’t even connect Washington and Express until after I’d seen the latter. That means I was able to enter Express without a preconceived disdain for its director, so I was open to its charms. Or I would’ve been open to its charms if it’d offered any. My, what a pointless mess of a movie! After I saw the movie theatrically, I noted on a message board that the entire girlfriend plot was useless. The film could've completely omitted the Angie character/thread and been no worse for it - that whole side of the movie was virtually useless. Actually, the whole damned movie was pretty much useless. I chuckled three or four times and that was it. The rest of it was a relentless mix of pot smoking and slapstick. Can't think of anything clever? Let's hit someone in the head with an ashtray! Slapstick has been around forever, but it's turned into cheap comedic shorthand. Movies just throw out the violent gags as an easy laugh, and they're everywhere - almost every comedy these days resorts to slapstick non sequitors to milk uncreative humor. It's as bad as the use of handheld camerawork to make dramas/action flicks "edgy". I’ve seen Express described as a movie about pot smoking told from a pot smoker’s point of view. Perhaps that’s correct, and maybe that’s why I didn’t like it. Never having been one to partake in the demon weed, I can’t relate to that viewpoint. But it seems to me that if you must be stoned to enjoy/understand a movie, then that movie comes with inherent flaws. For me, Express wasn’t funny and it seemed pointless. Add to that the fact it felt like it went on forever and this became a rather unenjoyable experience. 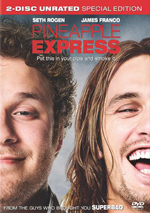 Pineapple Express appears in an aspect ratio of approximately 2.40:1 on this single-sided, double-layered DVD; the image has been enhanced for 16X9 televisions. Only a smattering of fairly minor issues affected the transfer. For the most part, sharpness looked good. At times, wider shots tended to be a little soft, but those examples weren’t terribly intrusive. Much of the film appeared pretty accurate and concise. No concerns with jagged edges or shimmering occurred, and edge enhancement remained minor. Source flaws also failed to create many problems; I saw a couple of specks and that was it. In terms of colors, Express tended to stay with a natural palette. Hues took on a light golden tone at times, but that stylistic choice didn’t overwhelm. Instead, the colors appeared pretty clear and concise. Blacks were deep and firm, while shadows showed good delineation. Overall, this was a pleasing presentation. I also felt the Dolby Digital 5.1 soundtrack of Pineapple Express worked fine, though I anticipated something livelier. The film came with a few action scenes, and those didn’t flesh out the spectrum as well as I expected. They added a bit of pizzazz to the proceedings, but not a lot of activity filled the room. The back speakers mostly focused on general ambience; even when the film boasted gun fights, the front channels clearly dominated. That part of the track opened things up to a decent degree. Music demonstrated good stereo delineation, and the effects showed solid localization. This was never a particularly engrossing soundfield, but it created an acceptable sense of place. Audio quality was always good. Speech sounded crisp and distinctive, and music followed suit. The score was consistently lively and full. Effects also demonstrated nice vivacity and accuracy, with decent bass response along the way. Although I expected something a bit more involving from the mix, it still seemed more than acceptable. Expect plenty of extras across this set’s two discs. On DVD One, we begin with an audio commentary from director David Gordon Green, producers Judd Apatow and Shauna Robertson, co-producer/co-writer Evan Goldberg, writer/actor Seth Rogen, and actors James Franco, Danny McBride, Ed Begley, Jr., Rosie Perez, Craig Robinson and Kevin Corrigan. All sit together for this running, screen-specific track, though the roster varies; Begley splits early in the movie, and that’s about the time that Perez and Robinson arrive. Robertson pops up mid-film via the phone and hangs around for a little while before she exits so Corrigan can call in for a very quick remark or two. The commentary looks at the film’s origins and influences, sets and locations, story and character topics, props and production design, cast and performances, and a few other movie notes. On the positive side, the commentary provides an often fun, lighthearted look at the film. We get an uncensored chat and plenty of amusing remarks and tales along with a fair amount of decent behind the scenes details. Unfortunately, it starts to break down as it progresses; during the flick’s second half, we get far too many thoughts about how much the participants like various aspects of the film. That slows the chat more than I'd like, but it still offers enough to make it worth a listen. We can watch either the original 112-minute theatrical cut of Express or the 117-minute extended version. How do the two differ? As far as I could tell, not in many ways, though a few scenes are longer than their theatrical counterparts. I didn’t notice anything radically different between the two; I thought that extensions to existing sequences accounted for the extra running time. Four Extended and Alternate Scenes run a total of nine minutes, 36 seconds. These include “Private Miller” (2:21), “Forest” (1:52), “Asians In Van” (0:49) and “Diner” (4:34). “Forest” is the only one that adds any exposition, as it tells us a little more about the private lives of Dale and Saul. The others just extend existing scenes, so they lack the same potential value. Next comes a four-minute and 55-second Gag Reel. Most of this sticks with the standard goofing around and slip-ups, but a few improv bits emerge as well. That makes it more interesting than the average blooper collection. A little behind the scenes material arrives via The Making of Pineapple Express. This 21-minute and seven-second program provides info from Green, Rogen, Apatow, Franco, Goldberg, McBride, Perez, Robinson, Green’s parents Jeanne and Gordon, production designer Chris Spellman, and actor Gary Cole. “Making” examined the project’s roots and development, Green’s involvement, cast, characters and performances, Rogen’s work as co-producer, and general thoughts about the flick. For the most part, the info provided here remains pretty lackluster. However, “Making” compensates with lots of behind the scenes elements. We see many clips from the set and a number of rehearsal pieces as well. Those allow it to become an interesting show. A few ads open DVD One. We get clips for Paul Blart Mall Cop and The Wackness. These also appear in the Previews area along with promos for Step Brothers, Superbad and Balls Out: Gary the Tennis Coach. With that, we head to DVD Two and tons of cut footage. We find three Deleted Scenes (3:10) as well as four Extended and Alternate Scenes (10:44). These cover “Elevator” (1:15), “Food’s Still Warm” (1:06), “Troy” (0:49), “Prairie Dog” (2:12), “Kids Buying Weed” (5:29), “Police Liaison” (1:58) and “Angie’s Hotel Room” (1:05). These all feel like More of the Same. They’re no better or worse than anything in the final movie; they’re just more. That should mean they’ll entertain fans. Phone Booth runs six minutes, 14 seconds and presents two alternate takes of the phone chat between Dale and Angie. In an interesting twist, Apatow does Angie’s lines and also directs Rogen a bit. This means many variations on the sequence and a cool extra. A staple of DVDs for Apatow flick, Line-O-Rama goes for three minutes, 28 seconds. As always, it collects a variety of alternate lines. As always, these are fun to see. For a variation on that theme, we go to the three-minute and 47-second Direct-O-Rama. It provides more alternate lines, but we hear Green as he asks for different interpretations. That makes it another interesting collection of bits. We get fake “archival footage” with Item 9. In this four-minute and 17-second piece, three "test subjects” react to their intake of Pineapple Express. It’s mildly entertaining. Something different shows up during Saul’s Apartment. It contains four segments that fill a total of 13 minutes, 26 seconds. Each of these shows Red and/or Saul in the latter’s apartment as they smoke with/chat with others. It’s unclear for what purpose these were shot, as it seems obvious they were never intended to be part of the film. Justin Long pops up for one – in addition to his appearance as one of the “Item 9” subjects – while we also find an assassin, Mr. Edwards and Saul’s bubbe. The clips are moderately interesting. Next comes 32 minutes, 20 seconds of *Raw Footage. These let us see uncut reels of five different scenes. They offer a good view of the filmmaking process since they let us see the production without cuts. During the five-minute and 44-second Begley’s Best, we learn about the actor’s line of environmentally friendly products. It plays like it’s a gag, but it’s not; Begley really does market his own stuff, albeit on a small scale. Who knew? Shot at the same time as “Saul’s Apartment”, Red and Jessica’s Guide to Marriage goes for four minutes, 12 seconds. The happy couple relates their secrets to joyous matrimony. Like “Apartment”, this reel provides minor pleasures at best. Most of the remaining extras cover behind the scenes material. The Action of Pineapple Express goes for 12 minutes, 19 seconds as includes remarks from Rogen, Franco, Green, Perez, and stunt coordinator Gary Hymes. “Action” gives us details about many of the stunts found in the film. It offers lots of great behind the scenes footage and delivers a fine liitle look at its subject. For the four-minute and 56-second Injury Report, we hear from Rogen, Franco, and McBride. They detail the various pain and suffering they endured through the making of the film. We get a moderately interesting take on the accidents that came along for the ride. More action-related material shows up with Stuntmaster Ken. In this three-minute and 12-second clip, actor Ken Jeong – who plays an assassin – pretends to be stunt coordinator. It’s wacky and pointless. Two similar pieces arrive next. We find Rehearsal 3/6/07 “Police Liaison” (5:40) and Table Read 3/4/06 (8:28). Both allow us glimpses at various scenes in their early stages – plus one that didn’t show up in any way – so they’re fun to see. Next we get a look at a Comic-Con Panel. During the seven-minute and 33-second reel, we hear from Apatow, Rogen, Franco, and McBride. They throw out a few nuggets about the flick and answer silly questions from partners planted in the audience. A little amusement results, but not much. More ads launch DVD Two. We see bits for Blu-Ray Disc and The International. As expected, both show up under Previews along with clips for Nick and Norah’s Infinite Playlist, Lakeview Terrace, Quarantine, Resident Evil: Degeneration, Passengers and The House Bunny. The disc concludes with the red band trailer for Pineapple. Maybe Judd Apatow and Seth Rogen need to hide in a cave together for a while. They’ve been all over multiplexes over the last couple of years, and with the exception of the surprisingly hilarious Step Brothers, each film seems to be less entertaining than the last. Plop Pineapple Express at the top of that list. I found a mere handful of minor laughs here, as the vast majority of the movie left me bored. The DVD presents good picture and audio along with a pretty terrific set of extras highlighted by tons of cut footage. I don’t like the movie itself, but fans will feel pleased with this strong release.